A steel company has been fined £450,000 after a worker was badly injured when he fell back into an uncovered pit. 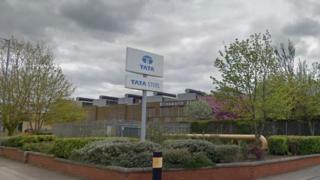 Sheffield firm Tata was sentenced by Judge Slater at Sheffield Crown Court. Tata was found to have breached Health and Safety Executive legislation after Steven Ayres, who worked as a scaler fell backwards into an empty pit. The firm had carried out a risk assessment in 2012 which identified the need for safety barriers, but they were never put in place. The court heard that when a skip is full at Tata, an operative calls for it to be removed. The two metal sheets covering the skip pit are taken away and the skip is lifted and emptied, leaving a pit measuring 3.7 x 2.5 x 2.25 m.
Mr Ayres, an "experienced employee", stepped back into the empty pit in February 2014 while the skip was being emptied and suffered a lacerated right kidney and broken ribs. He was in hospital for a week and recovered at home for more than a month and is now employed elsewhere. Judge Slater said Tata - which was called Corus until 2007 - could have been fined up to £800,000, but this was reviewed in light of the UK steel industry's "financial realities". He said Tata's accounts showed the company is "materially smaller" than four years ago, has recently been restructured to allow it to continue "as a going concern" and has received financial backing. The judge said any fine would impact on British Steel pension fund-holders. In addition, because Tata took steps to install safety barriers immediately and has now redesigned the area, and because it admitted guilt straight away at Sheffield Crown Court in March, Judge Slater said the company would be fined £450,000 with £33,000 costs, to be paid in two instalments.